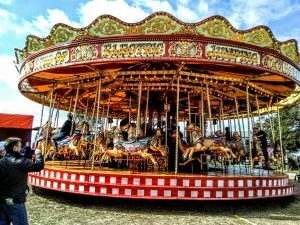 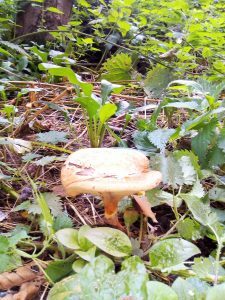 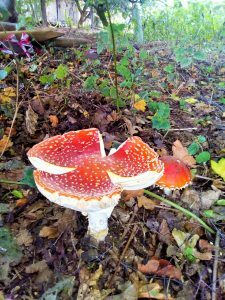 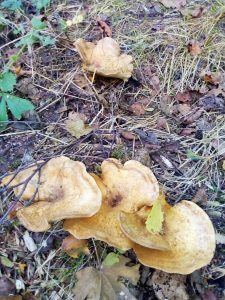 Patrington ~ Read All About It! 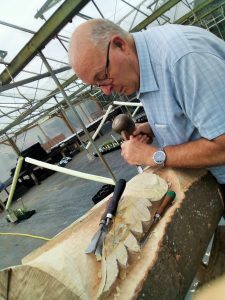 Above: Terry Bearpark getting everyone organised. 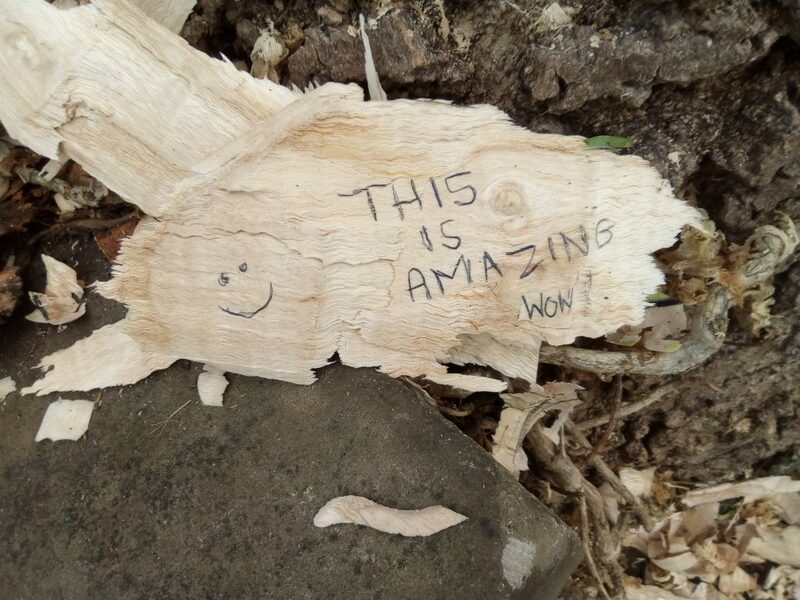 It’s nice to be appreciated! 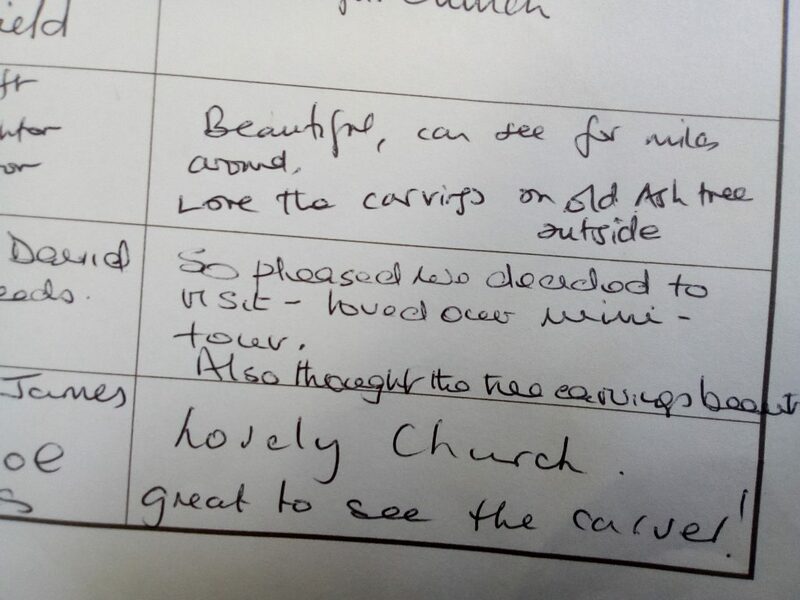 Kind comments in the church visitor book too! 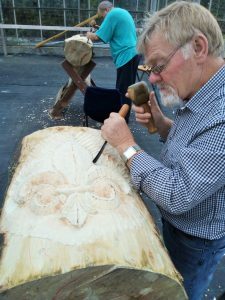 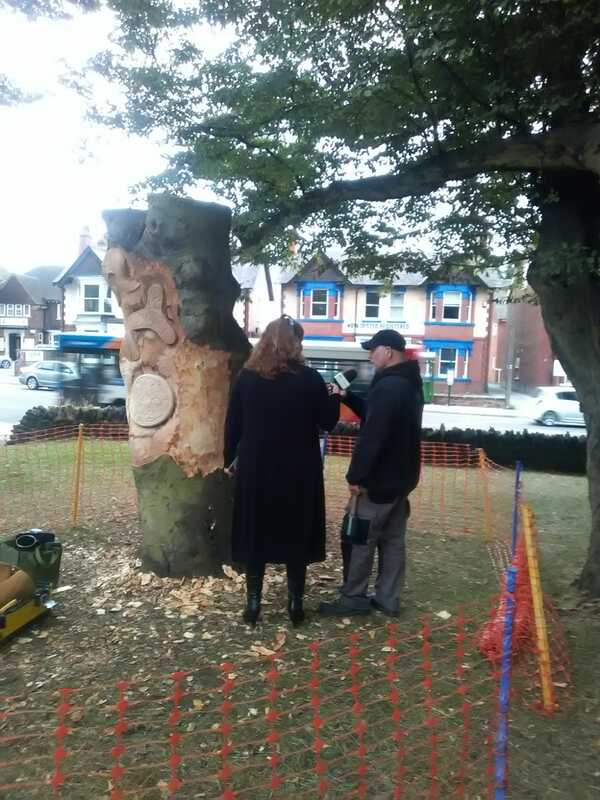 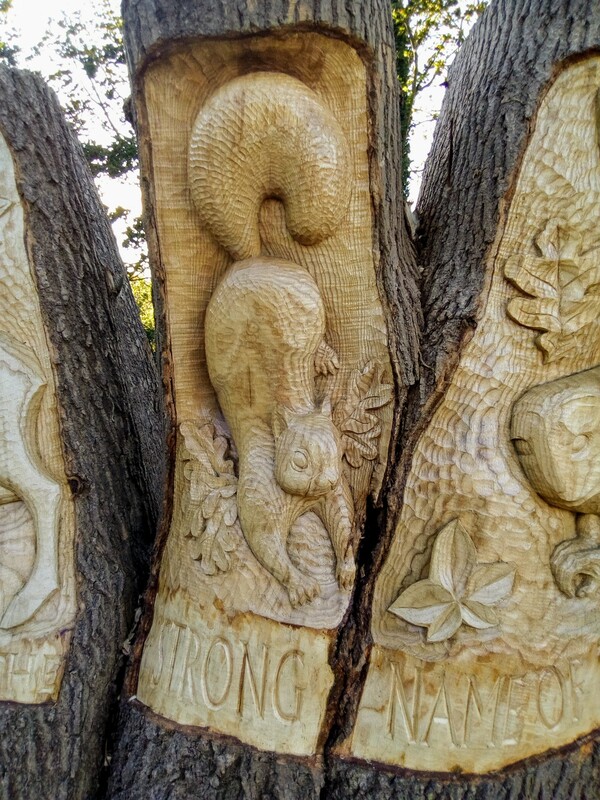 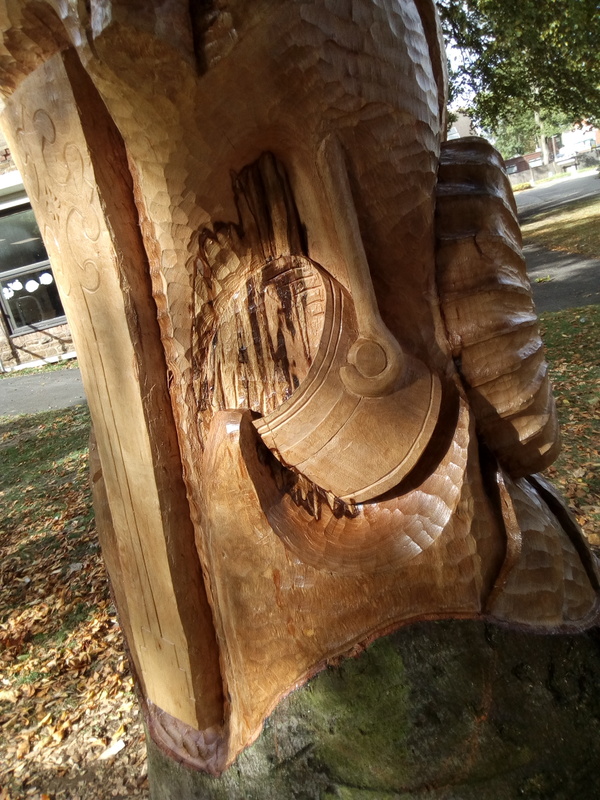 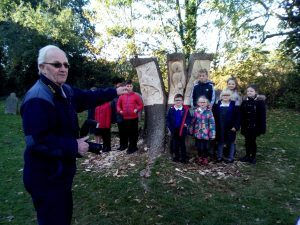 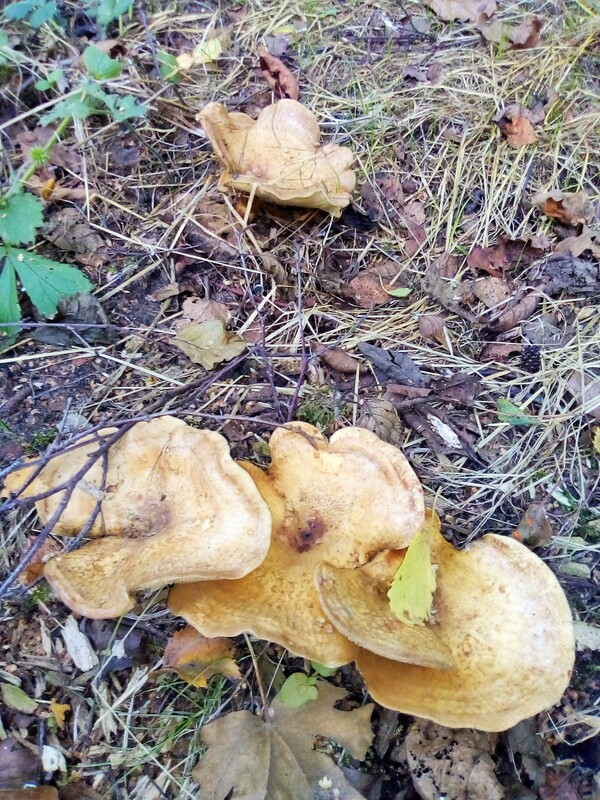 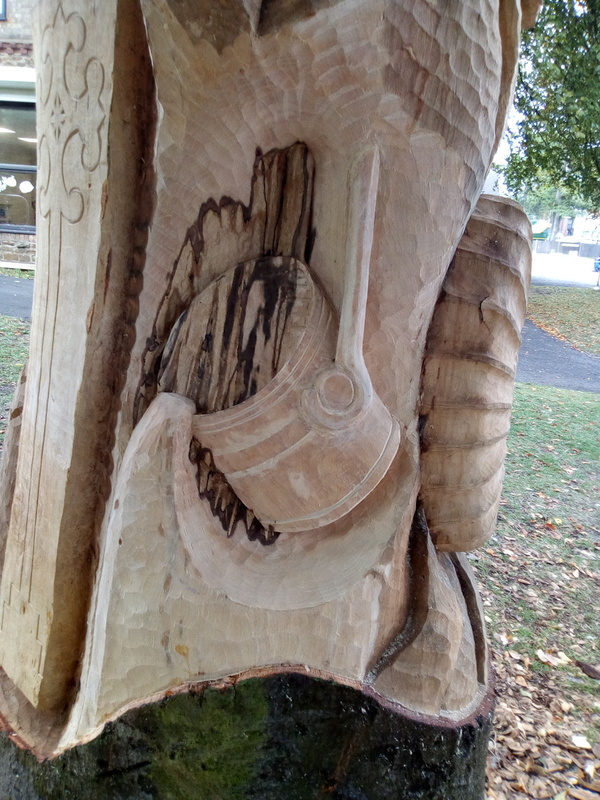 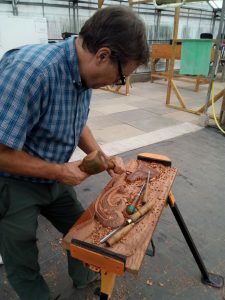 Posted in carving-news | Comments Off on Patrington ~ Read All About It! 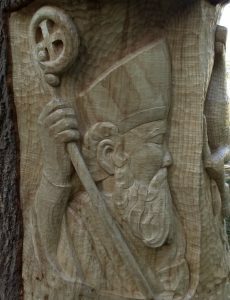 The next step was the text which was to run around a strip beneath each image: known as “Saint Patrick’s Breastplate”, these words were attributed to St Patrick during his Irish ministry in the 5th Century. “I bind unto myself the strong name of the Trinity” was chosen from the prayer (interestingly ~ considering the adjacent carving ~ also known as “The Deer’s Cry”), and the words fit perfectly from St Patrick right round to the owl. 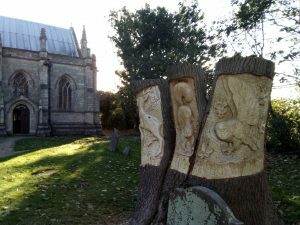 Another pleasant and enjoyable job to do, well received by enthusiastic villagers and visitors to this famous church; thanks again to all those who encouraged me with their enthusiasm and kind words throughout the process! I’d made a good start on the squirrel, and had left myself only the tail to do after light work on the head and paws. 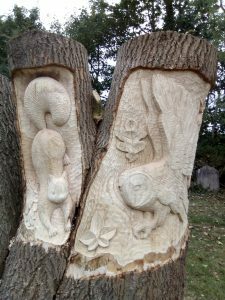 I finished off with some oak leaves, as though the squirrel was leaping through the boughs of an oak tree. 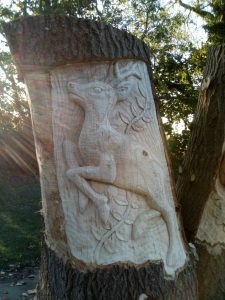 So, on to the deer. 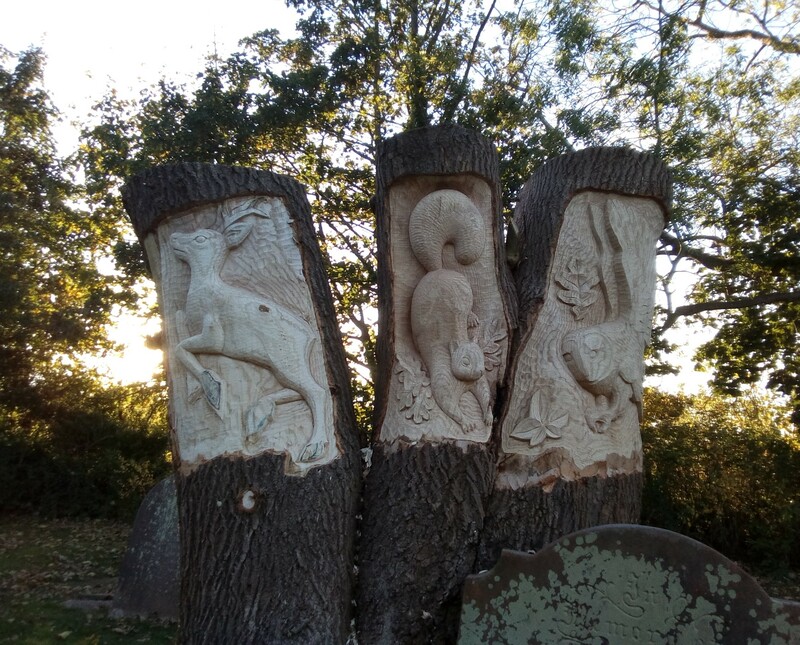 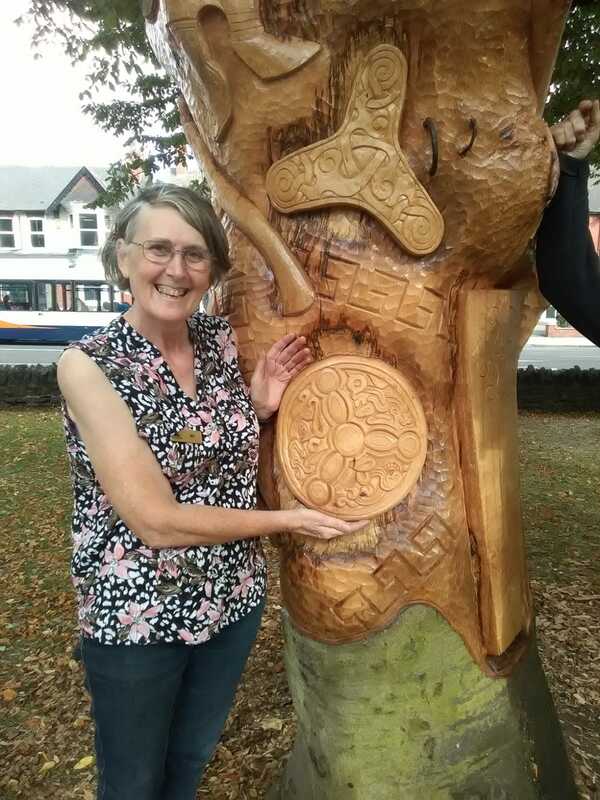 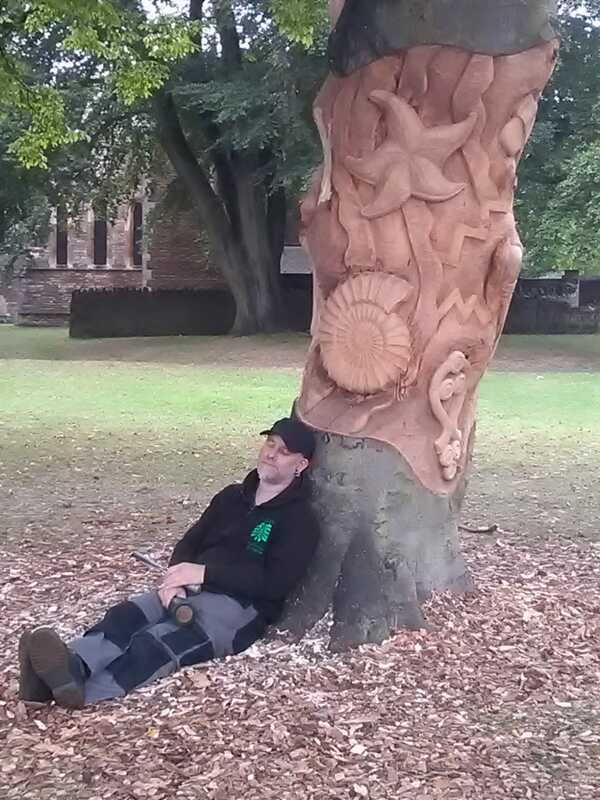 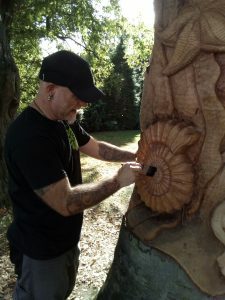 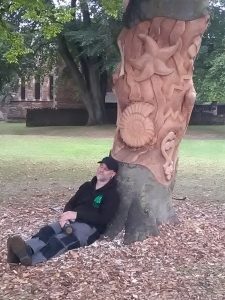 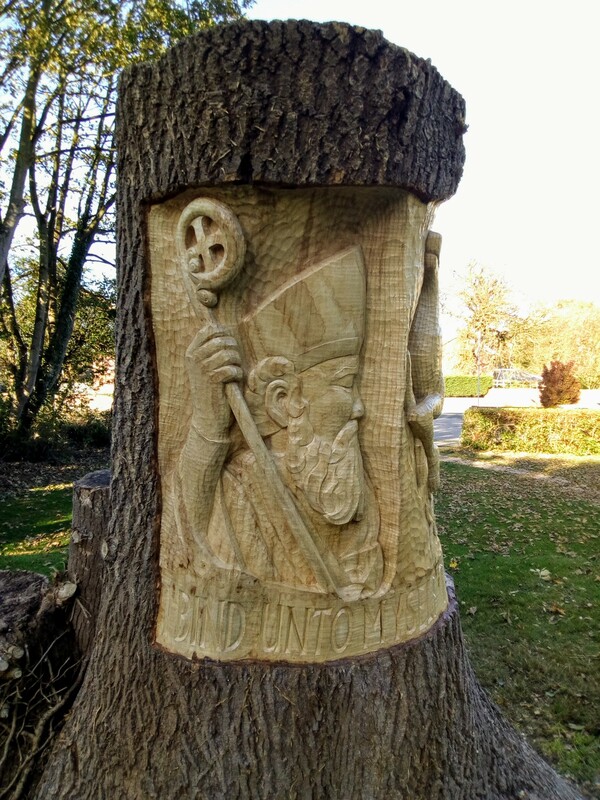 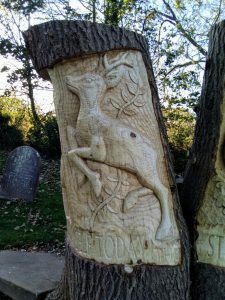 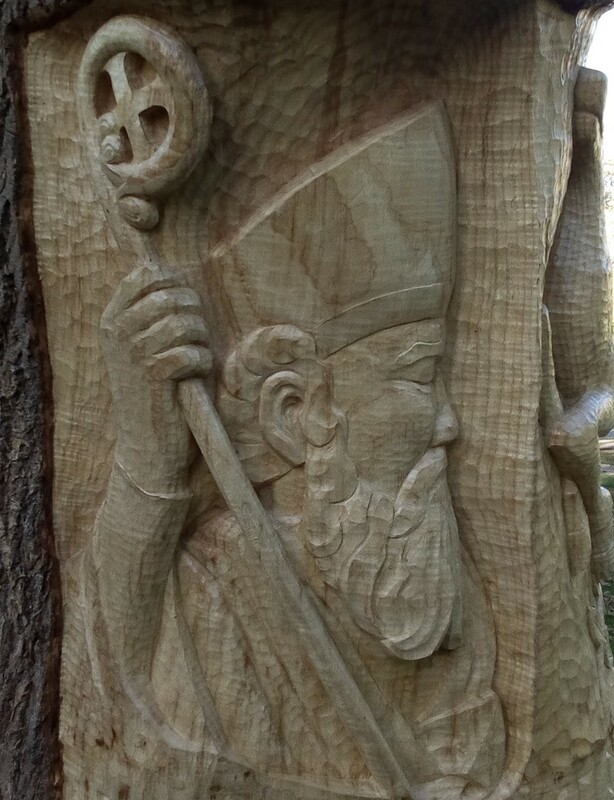 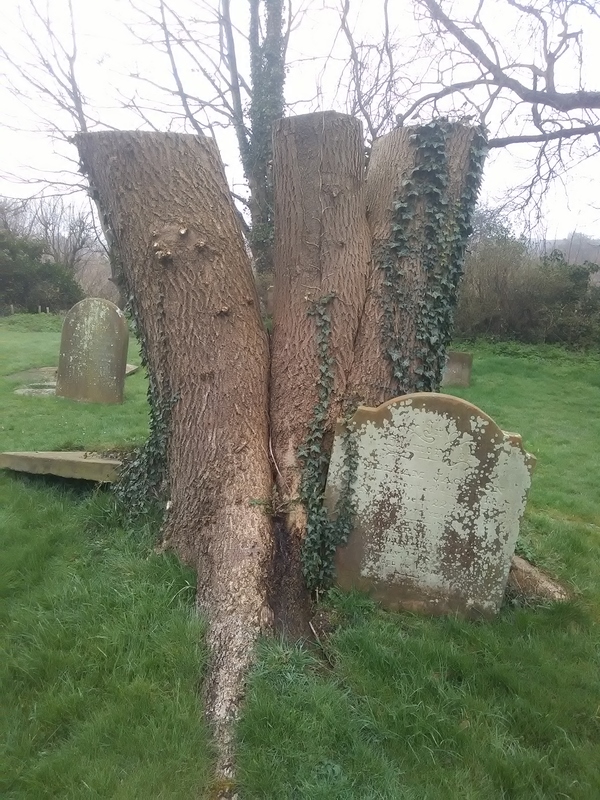 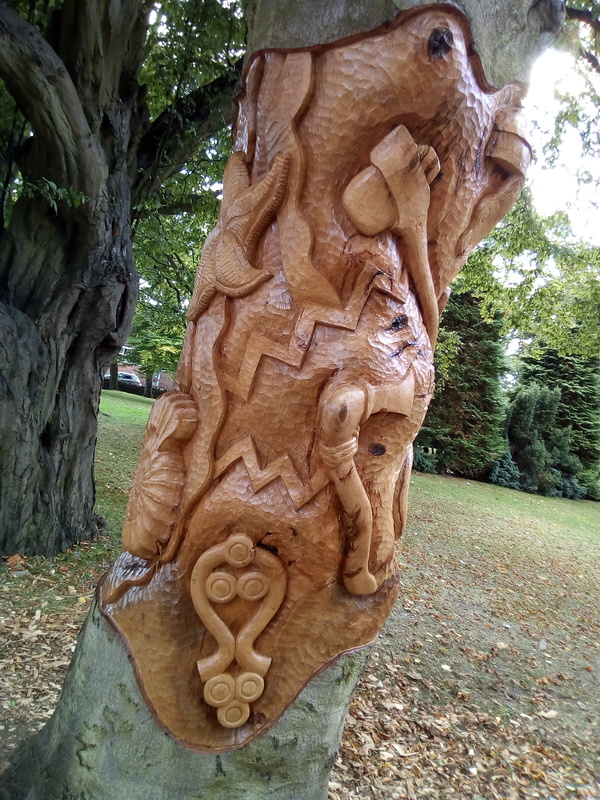 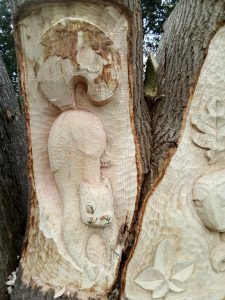 I was conscious of the fact that I had to carve St Patrick on the same trunk ~ so that he could be viewed from the church entrance ~ and therefore had to make sure the deer didn’t wrap around the trunk too much. 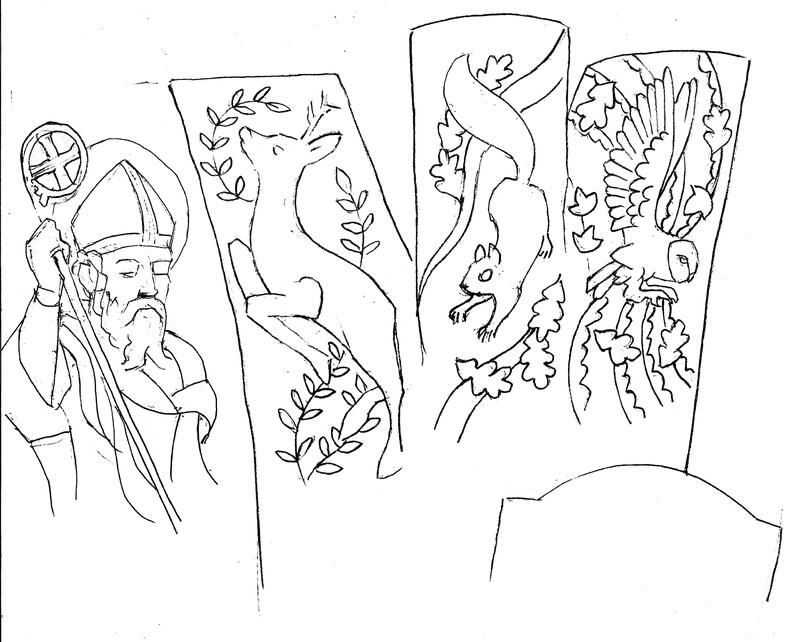 It meant I had to truncate the deer a little from my drawing, but he still retained the sense of movement I wanted. With the addition of some stylised ash leaves/branch, the deer was finished. 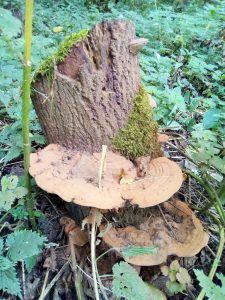 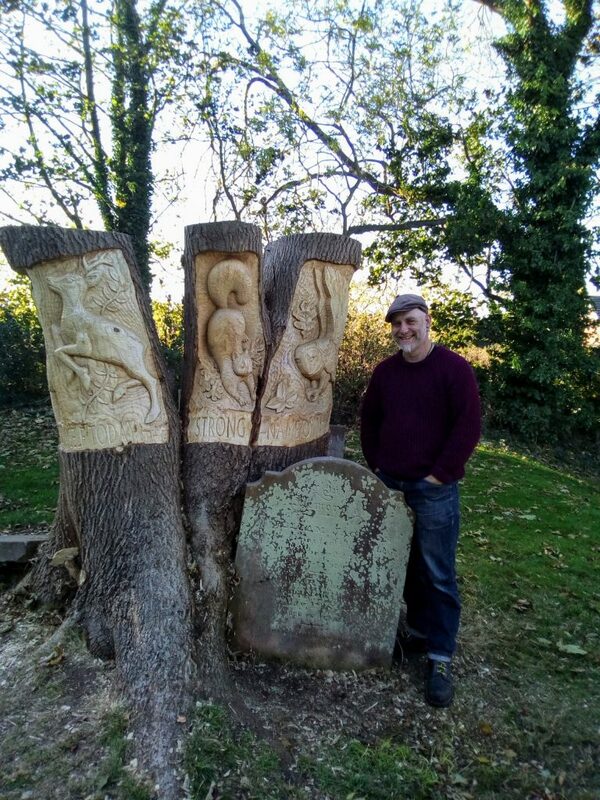 After a short break away it was on to St Patrick’s Church at Patrington, and three nice ash stumps to work on. 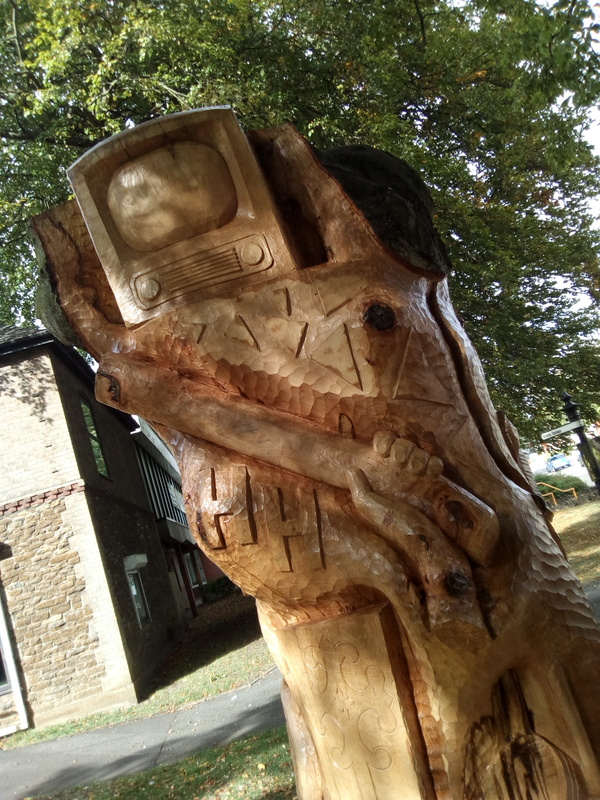 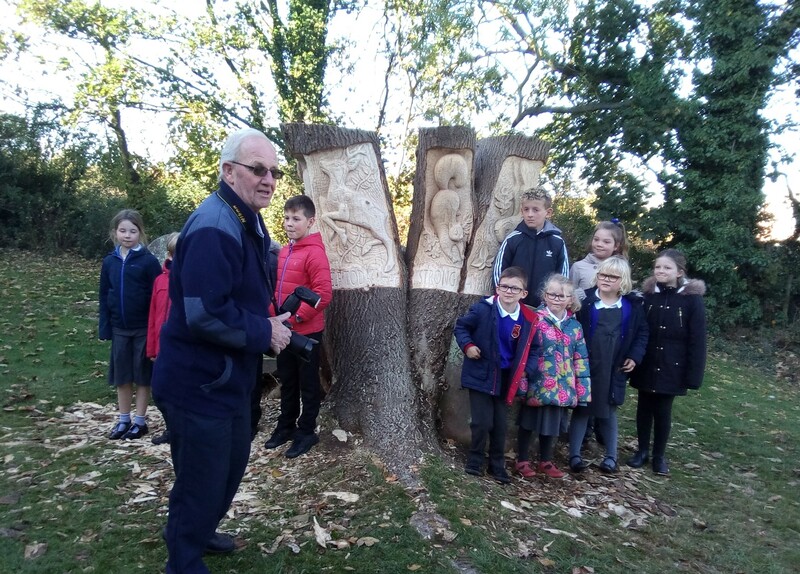 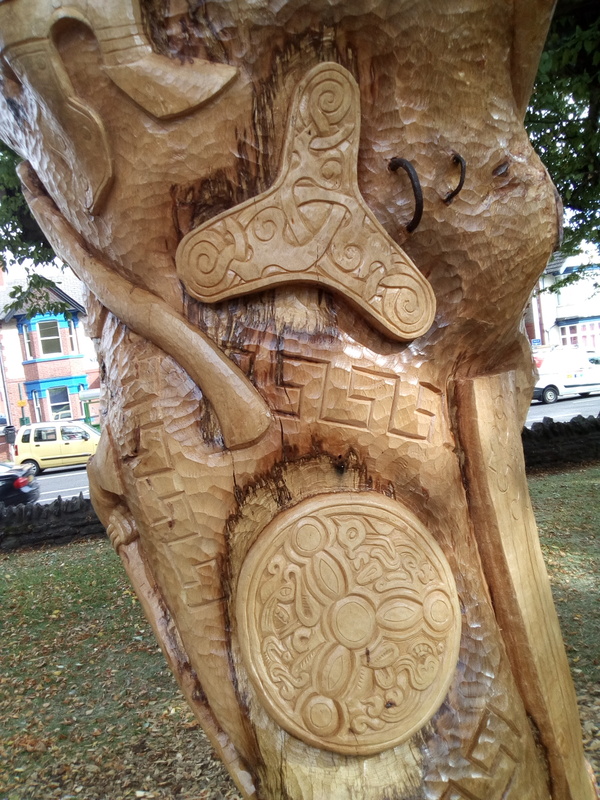 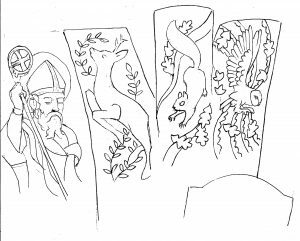 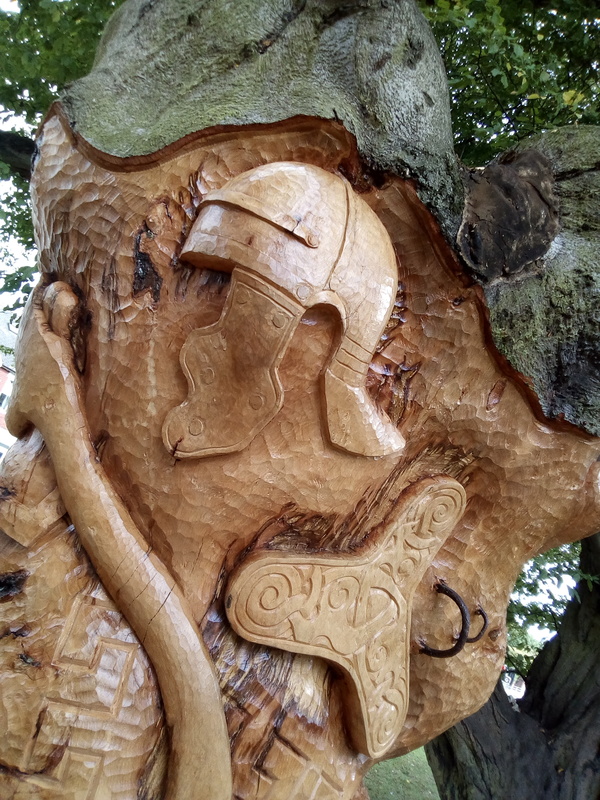 The design, like the previous job at the North Lincolnshire Museum, was assisted by pupils from the local school ~ but instead of a time line, this time it was locally seen wildlife and a representation of St Patrick. 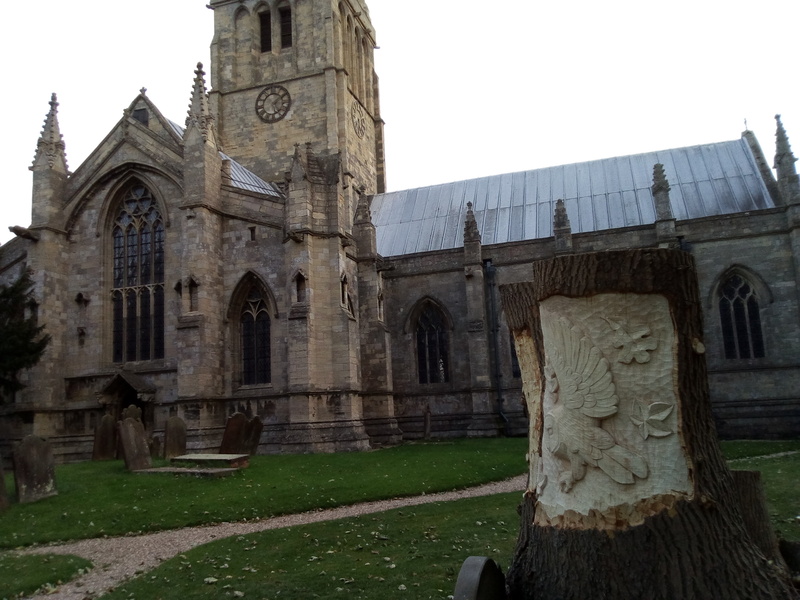 The children mainly went for owls, squirrels and deer, so I put one on each of the stumps, with St Patrick on the side of the deer facing the church. 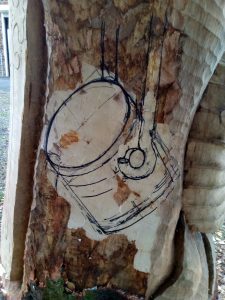 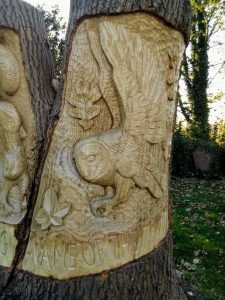 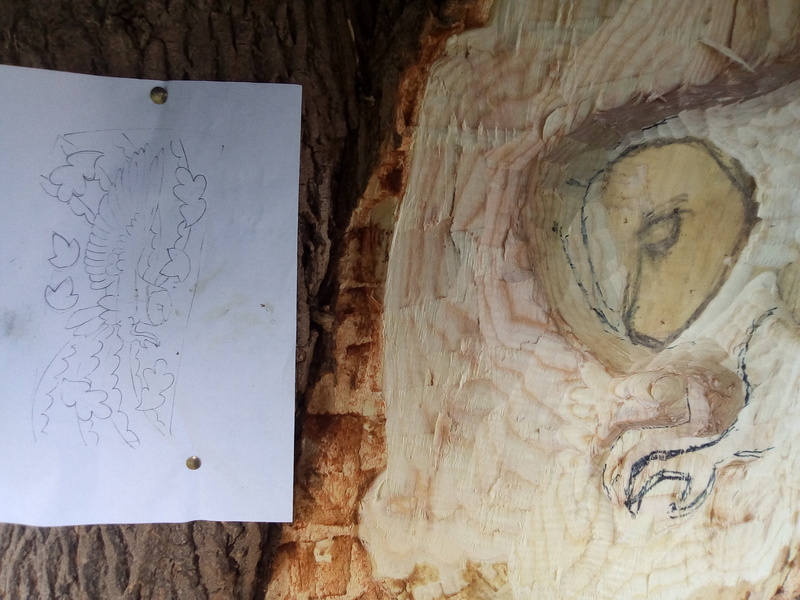 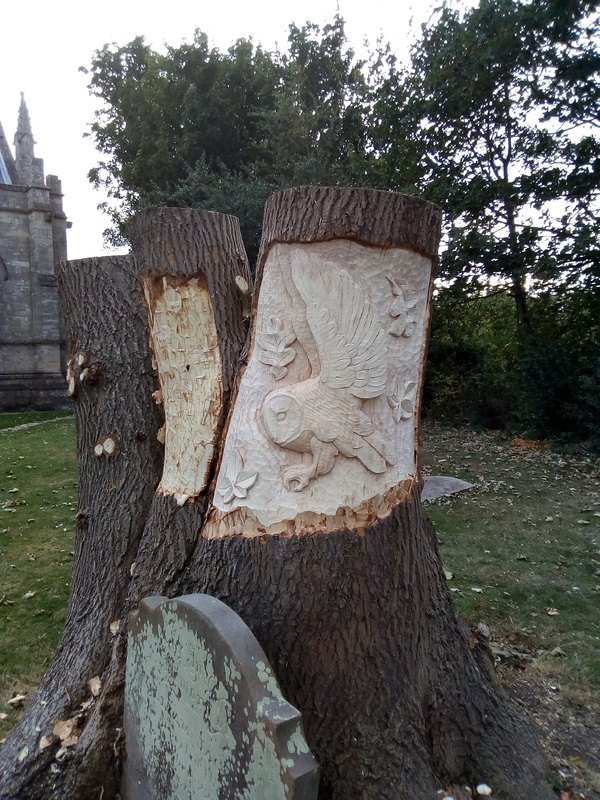 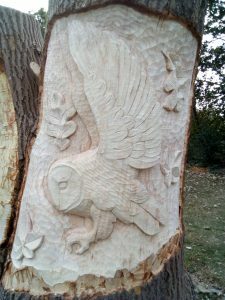 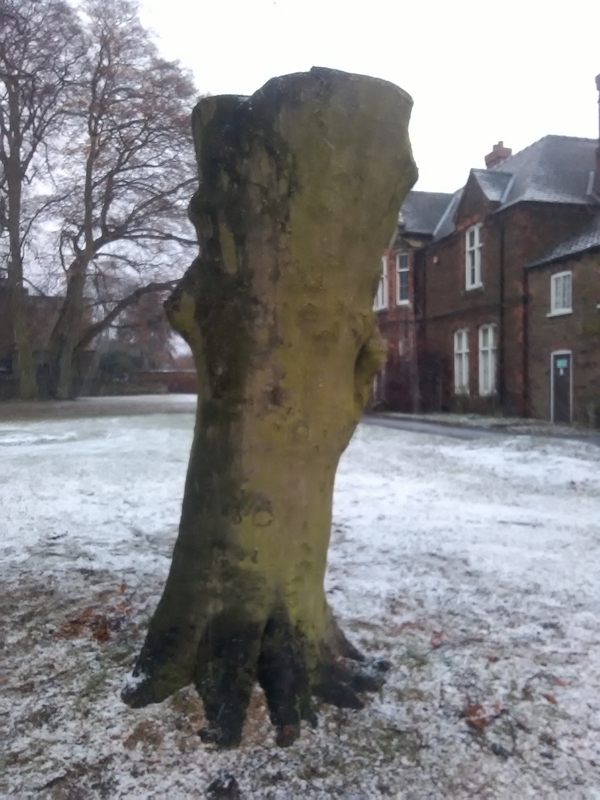 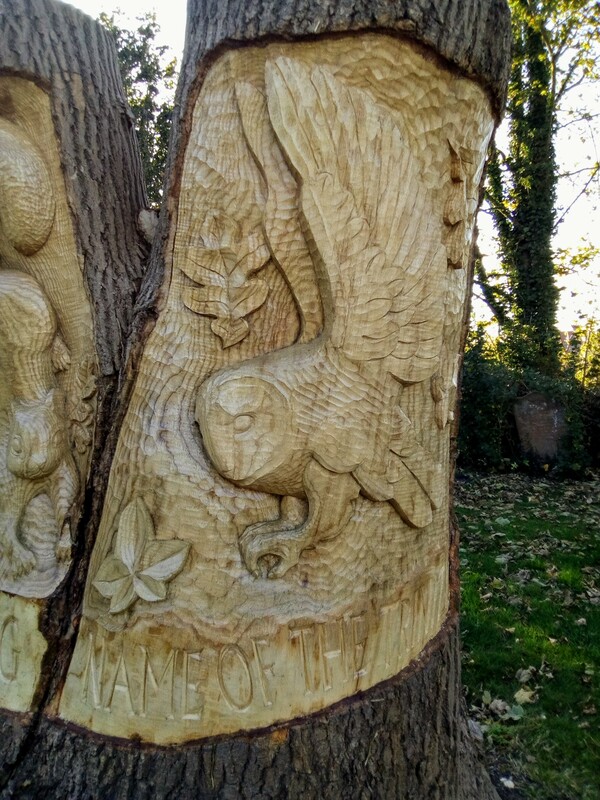 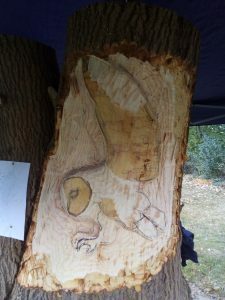 When I brought my designs to the tree, I realised the owl would work better reversed as it could be seen from the entrance path to the churchyard / church. 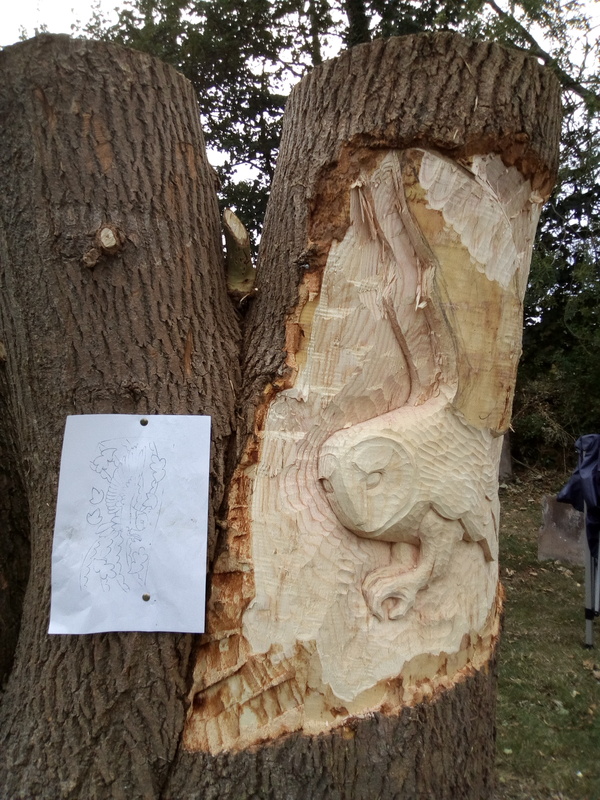 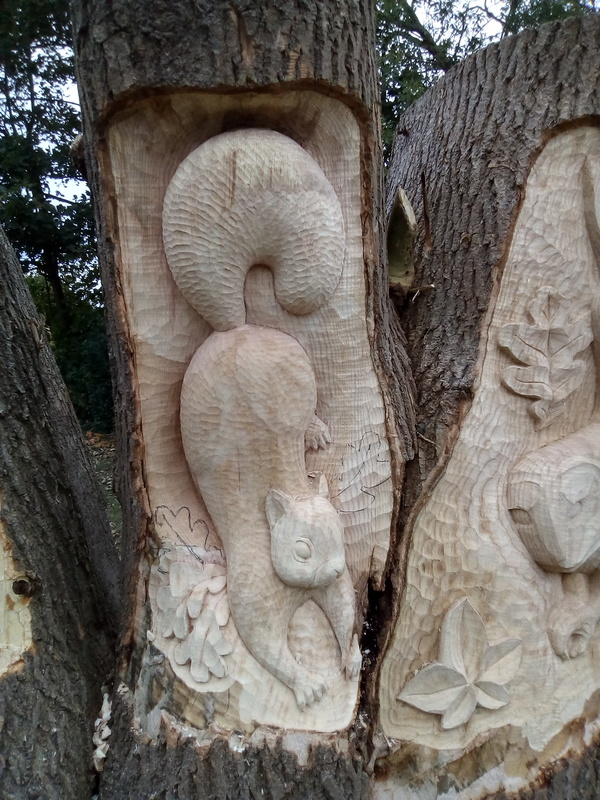 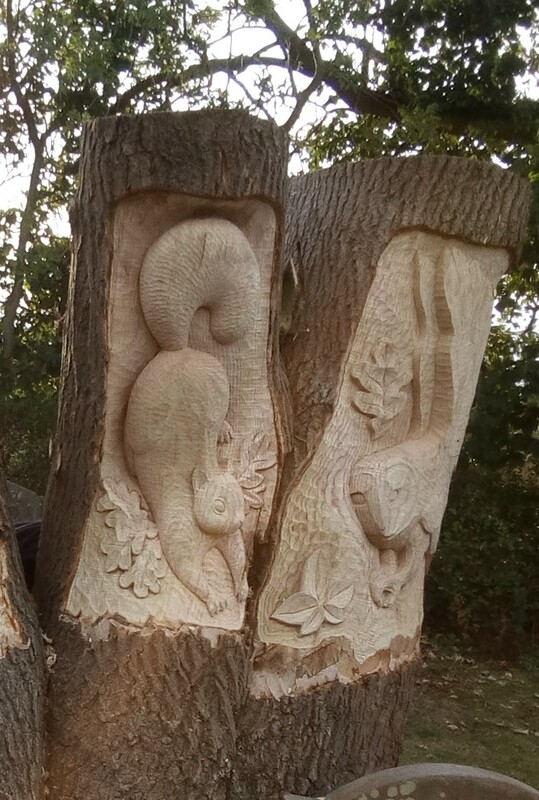 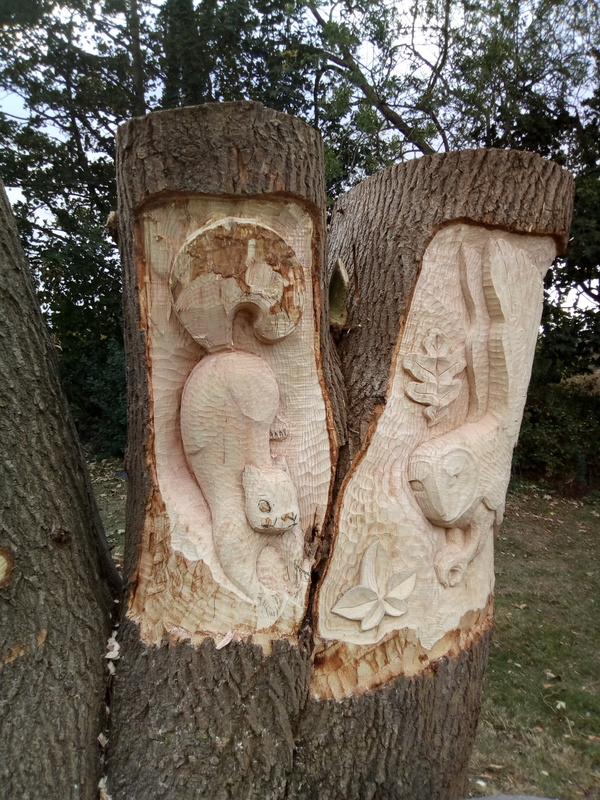 Since I’d changed the owl to face to the left, it balanced better if I also turned the squirrel round; I got quite a bit of the roughing out done and a bit of shaping too. It felt quite sad to be finishing this carving ~ I can’t think of another place I’ve worked where there has been such a constant stream of positive and enthusiastic comments from the visitors and passers-by; each day around 100 people (from infants to the elderly, most on their way to the museum, others making a special journey to see the sculpture) expressed their support and interest in the carving. 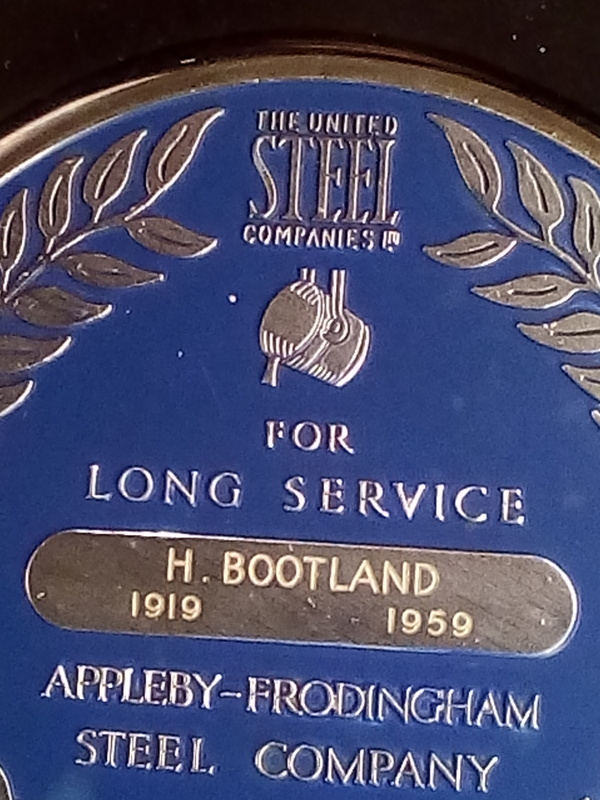 It’s been a very humbling, and enjoyable job. So, with all three coats of oil applied (and even the weather was supportive ~ a strong, warm wind helped each coat dry quickly and evenly), it’s goodbye to the North Lincolnshire Museum. 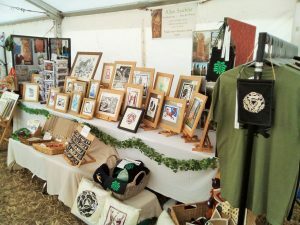 I urge anyone who’s not been to make a visit and see for themselves what a brilliant collection there is ~ and all locally sourced. 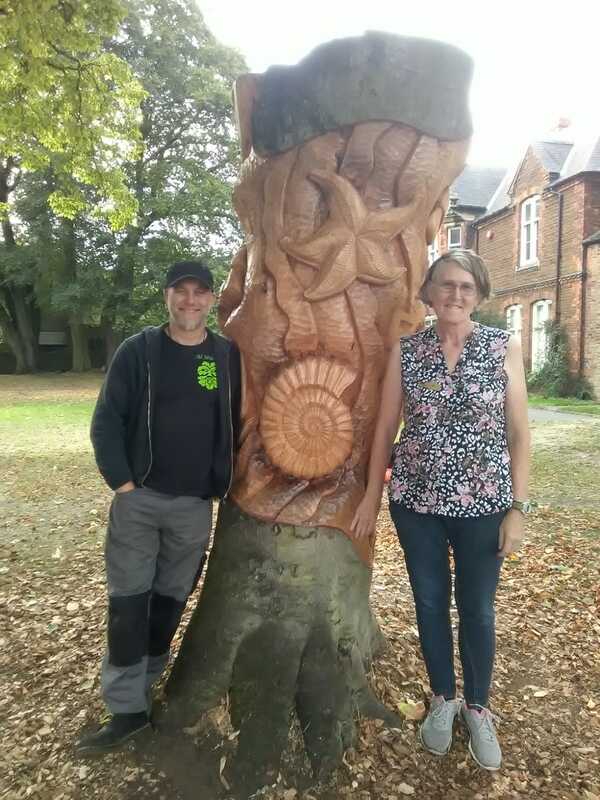 With Bev Oliver of North Lincolnshire Museum; Bev started the whole project and worked with the pupils of Bushfield Rd Infants School to get their design ideas. Her enthusiasm and help was much appreciated ~ thanks, Bev! Bev with her personal favourite ~ the Saxon shield boss. 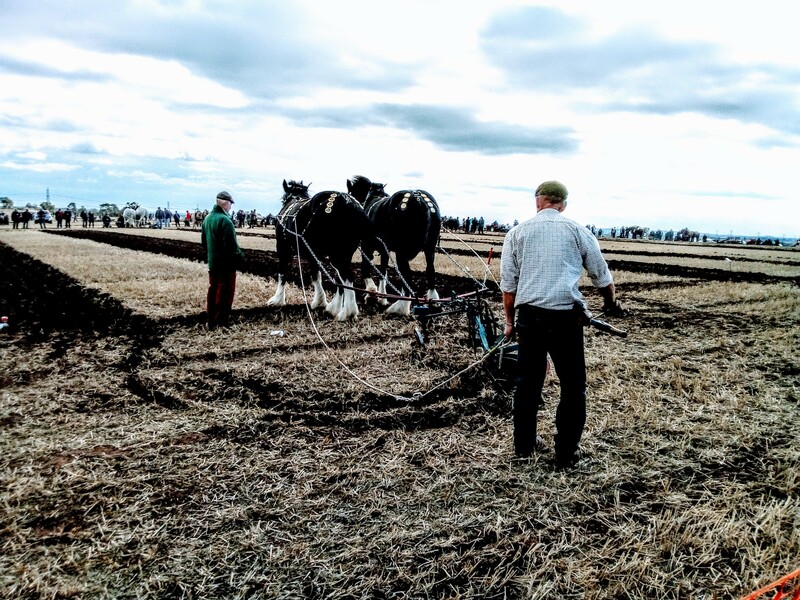 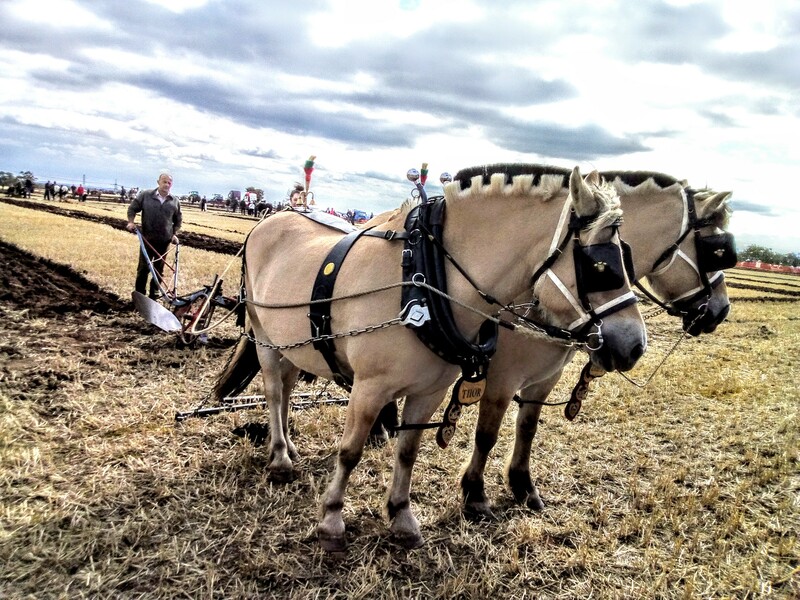 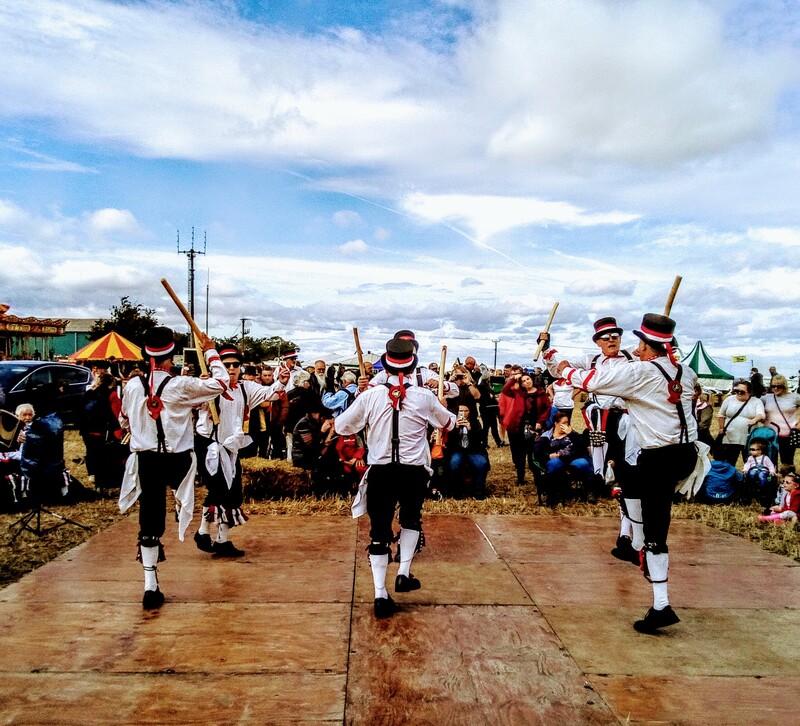 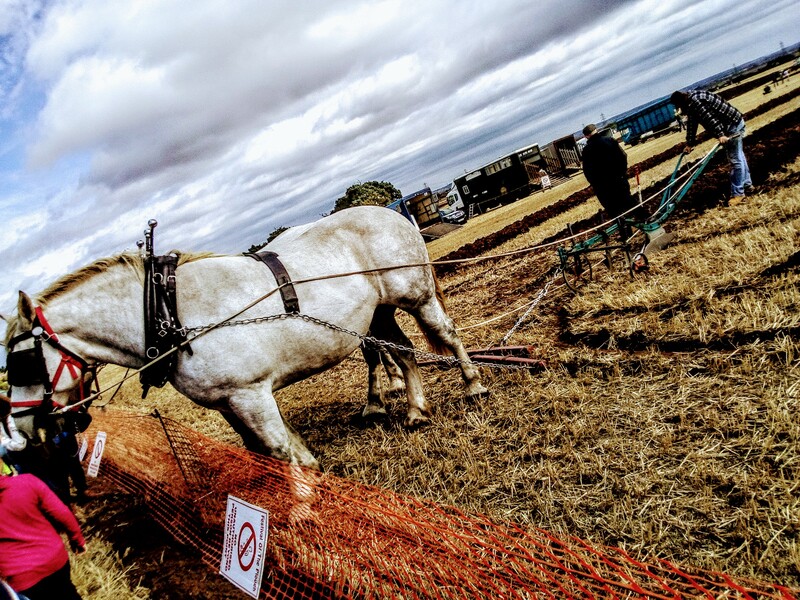 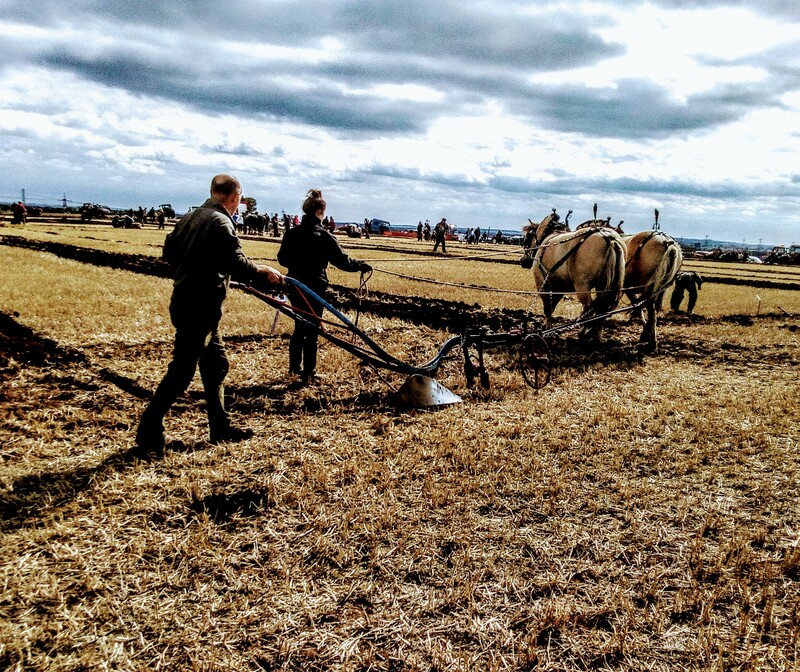 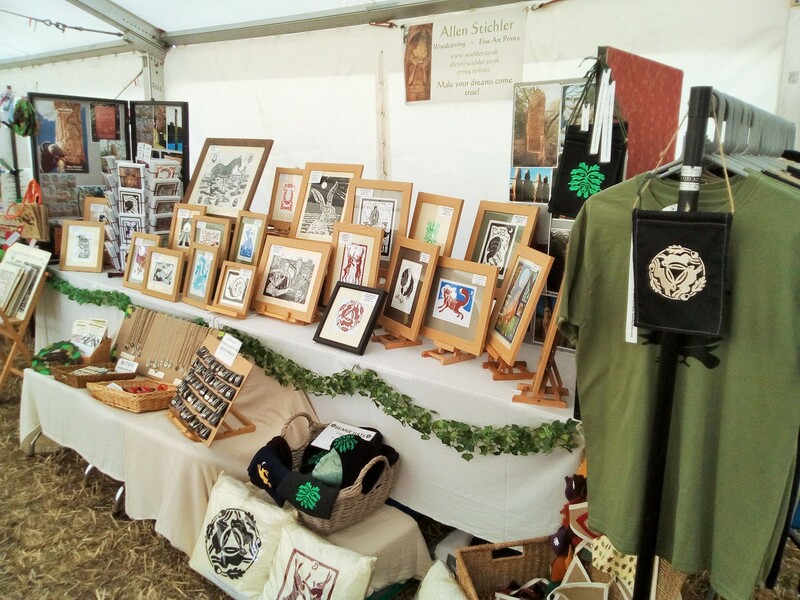 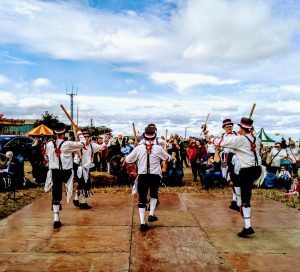 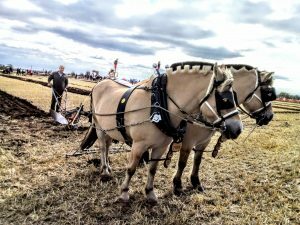 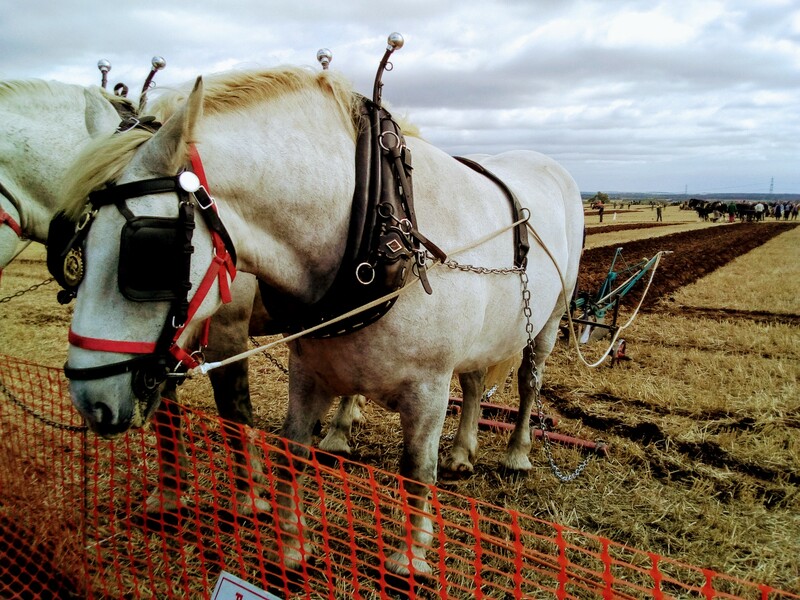 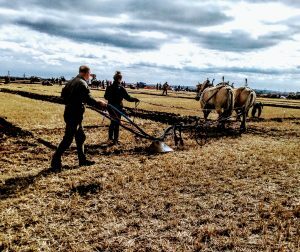 We had a brilliant day at the Epworth Festival of the Plough ~ a fantastic event with a wonderful atmosphere. 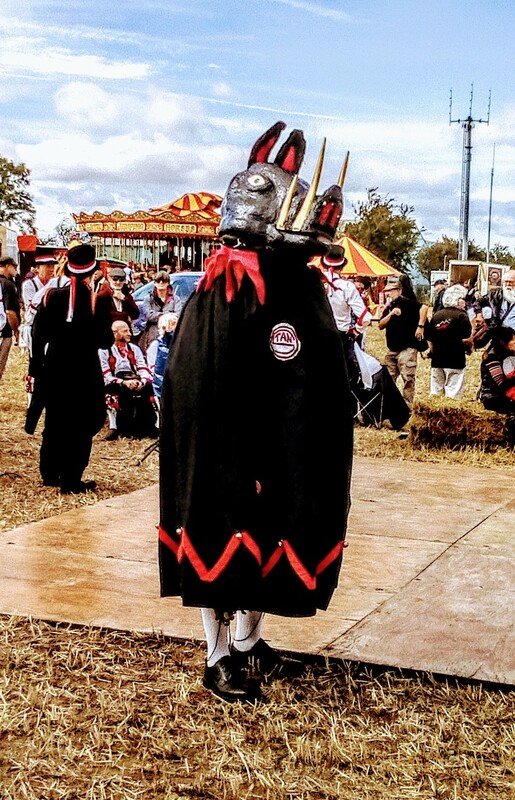 Apparently the organizers are looking for a new site to hold the festival otherwise it may be under threat, which would be a great shame as it’s been a fixture since 1980. 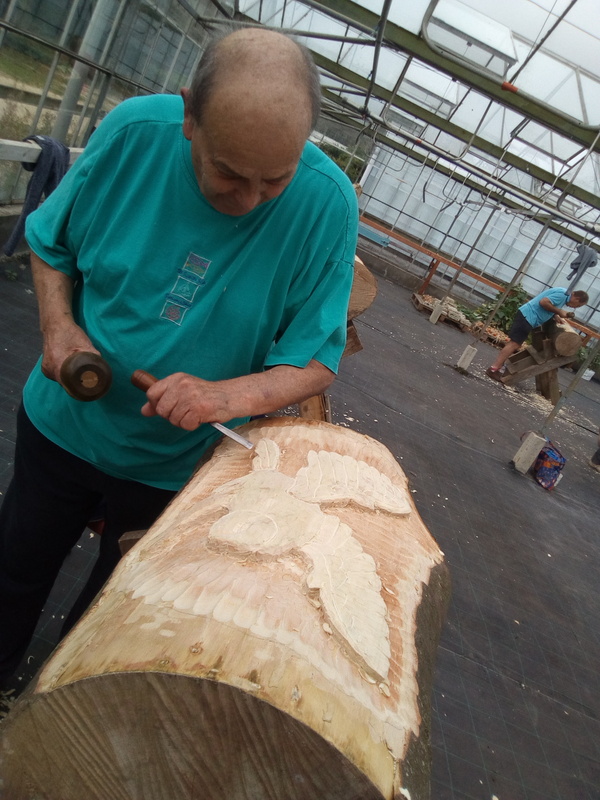 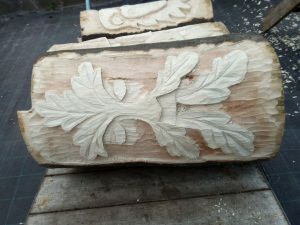 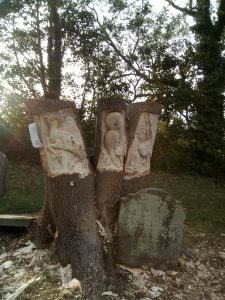 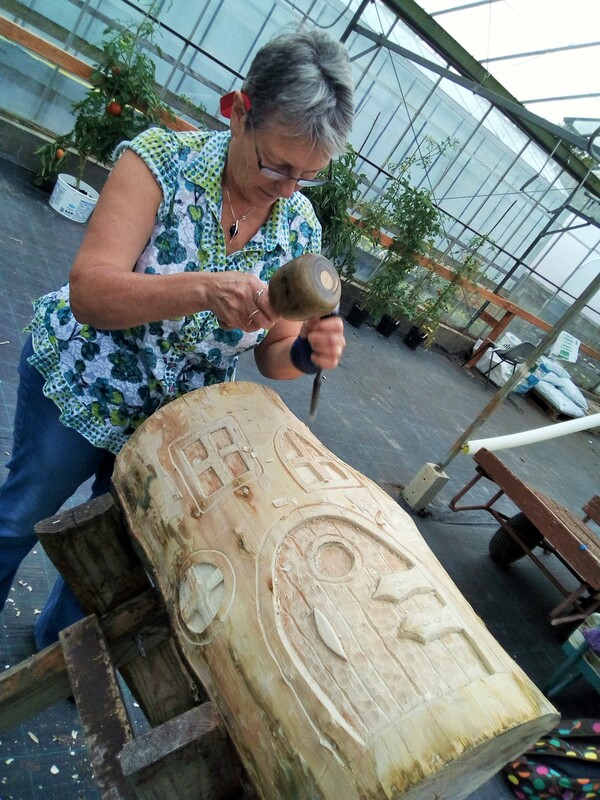 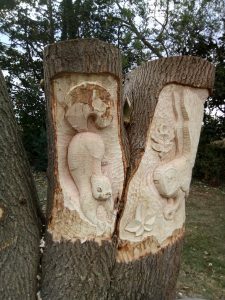 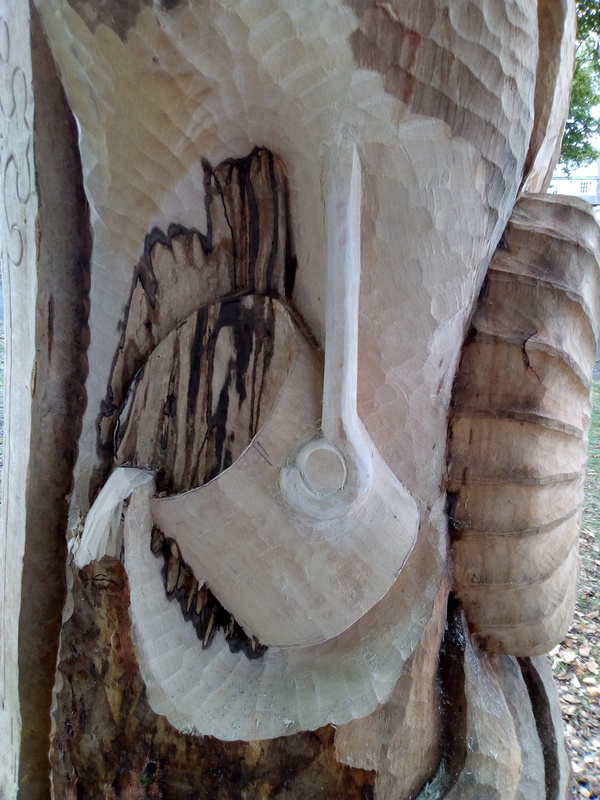 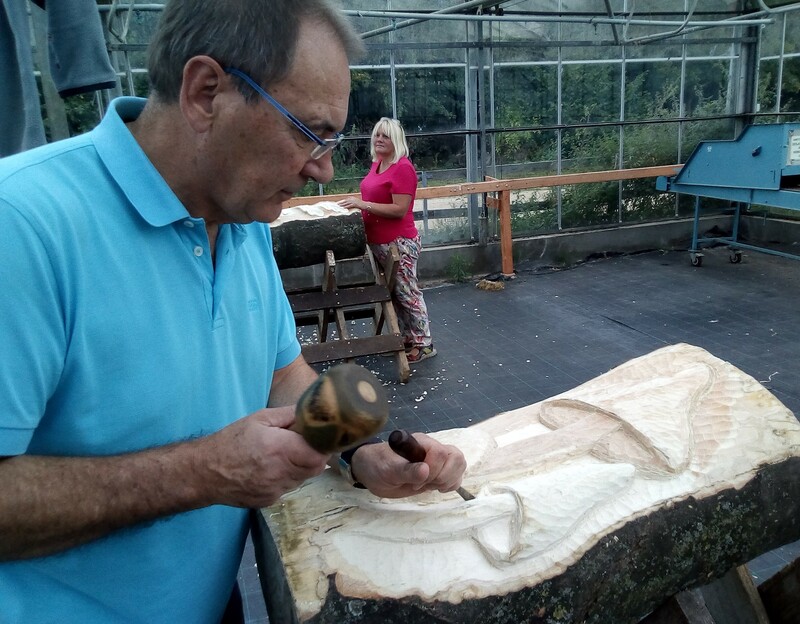 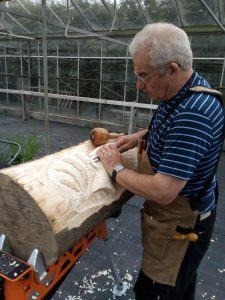 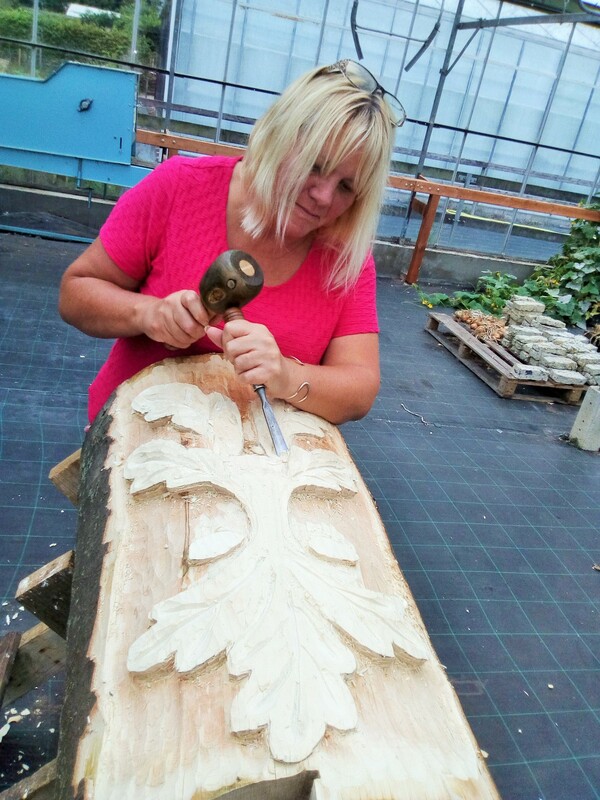 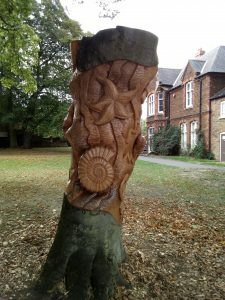 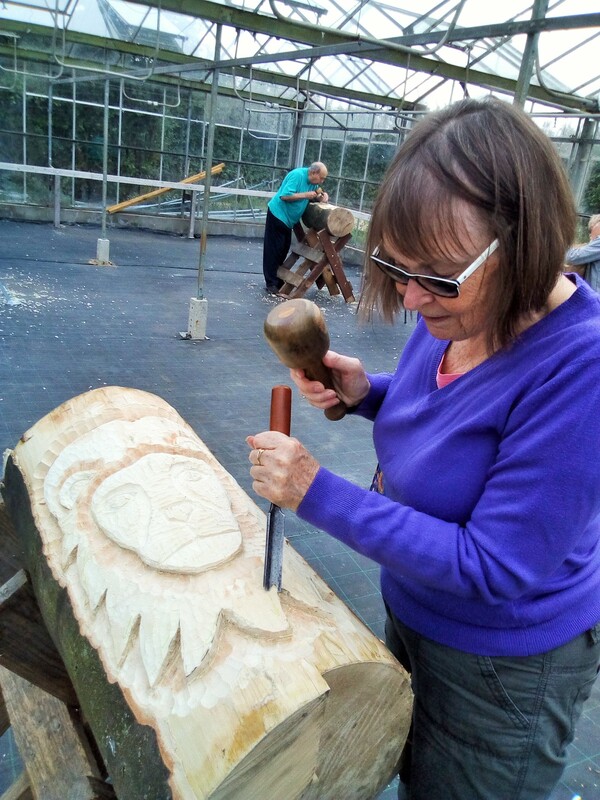 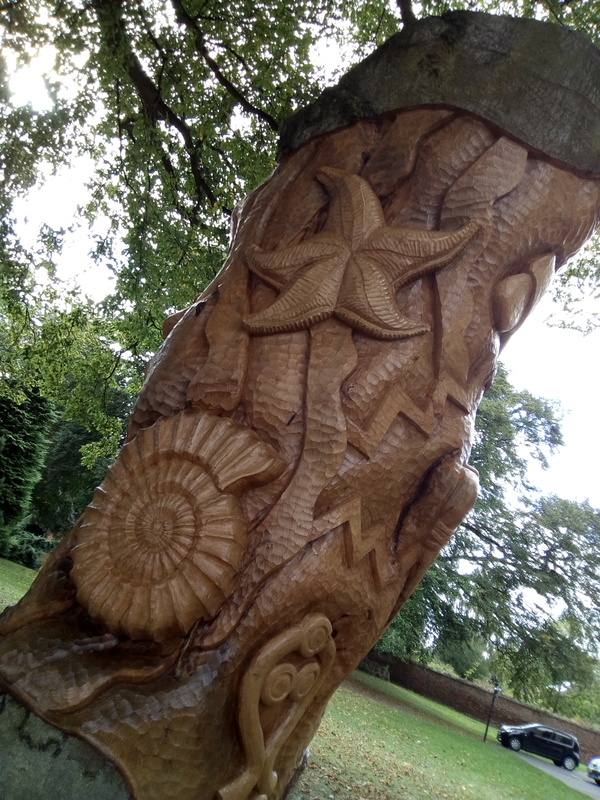 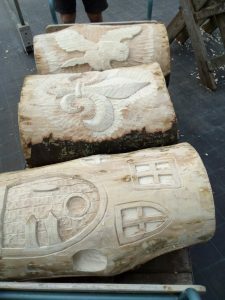 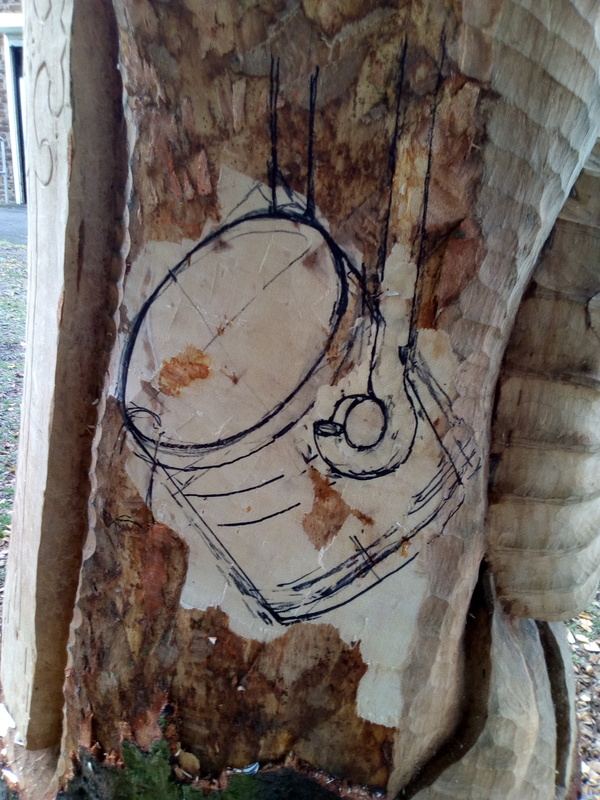 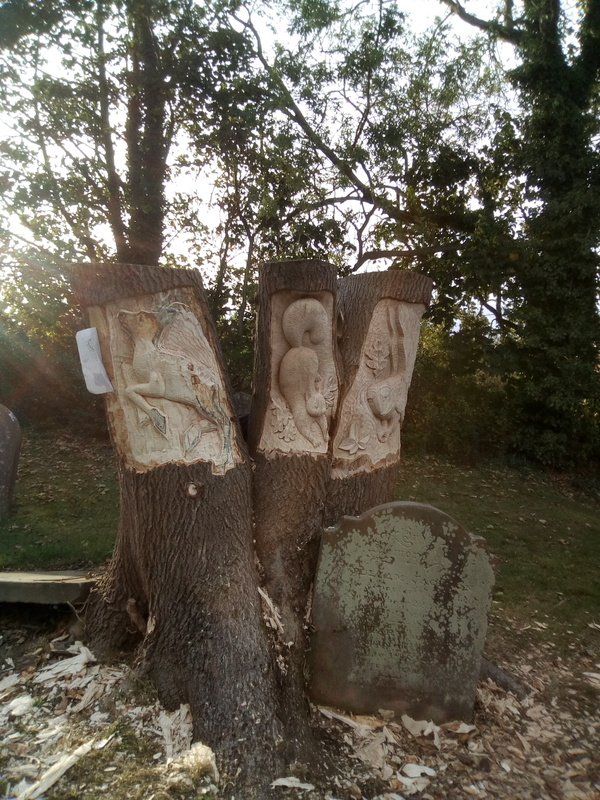 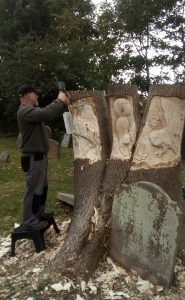 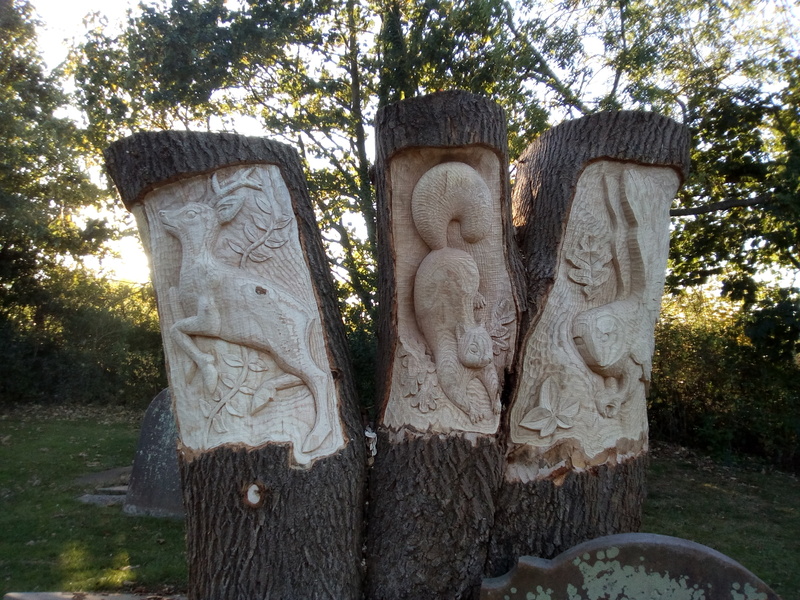 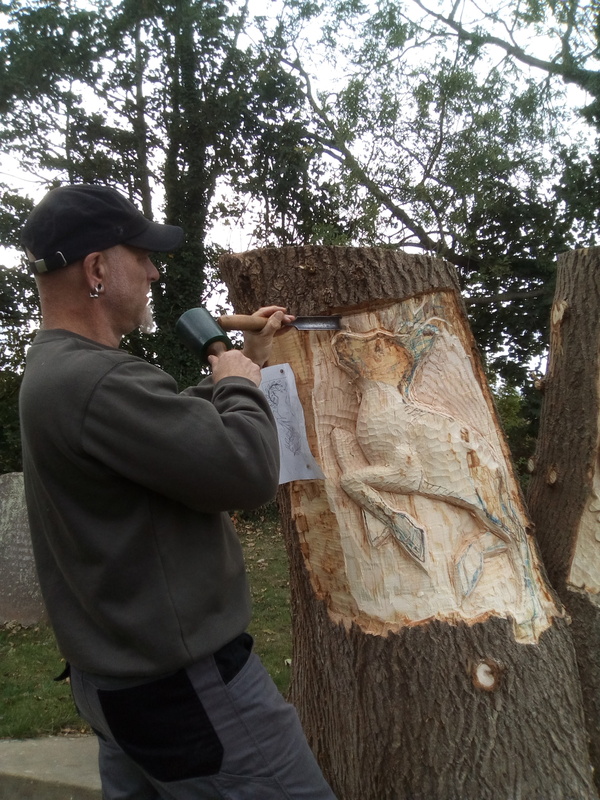 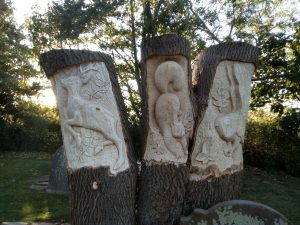 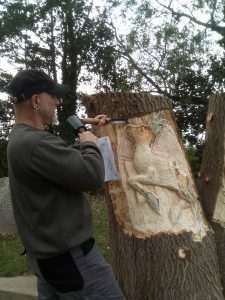 Final week of the carving course at Mires Beck! 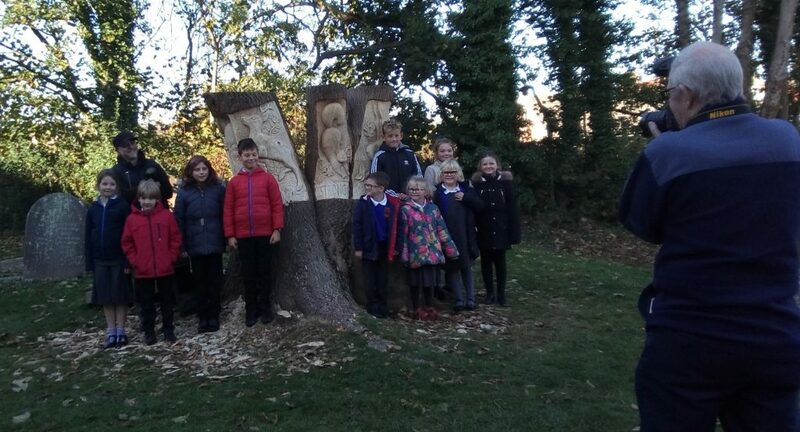 Well done to all, they look great. 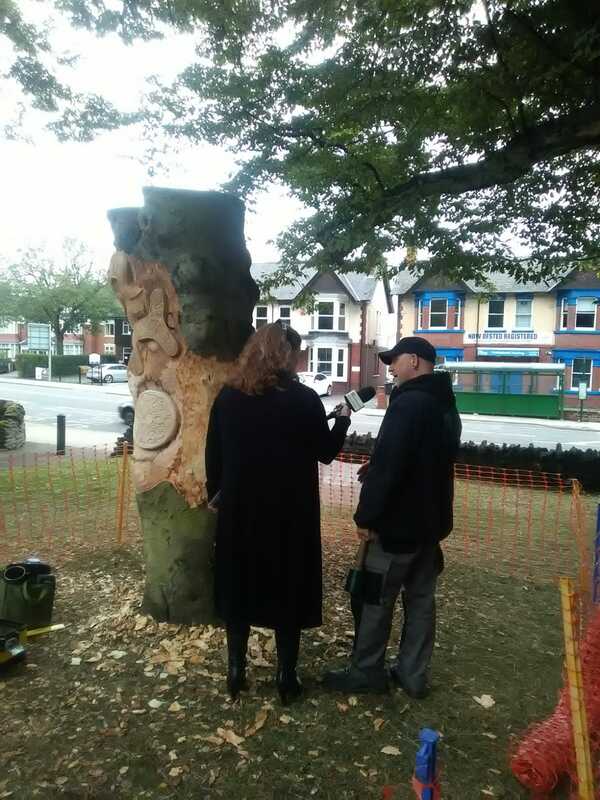 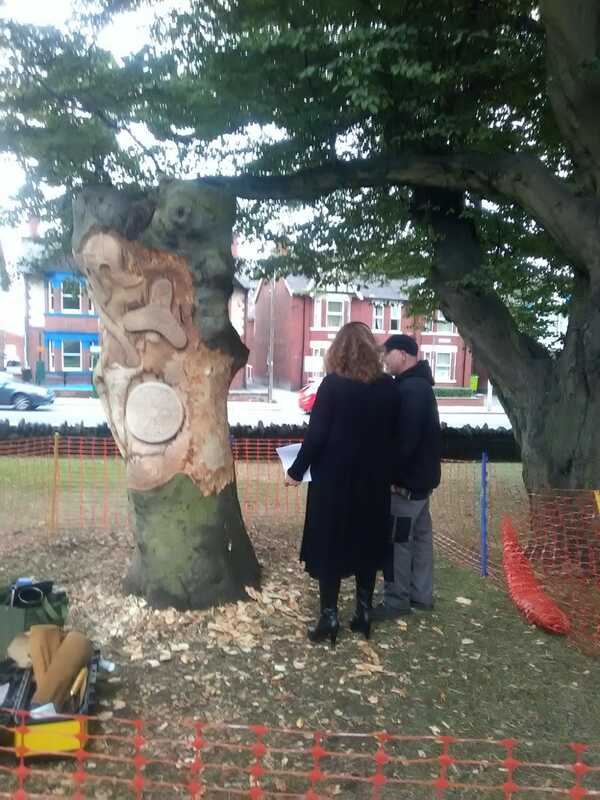 I forgot to put these pictures on from the end of August ~ Amanda White of Radio Humberside came for an interview and it ended up being quite a decent spot on the early morning show; a lot of people visited the tree on the strength of having heard the interview, and I avoided sounding like a gibbering wreck (I think!) 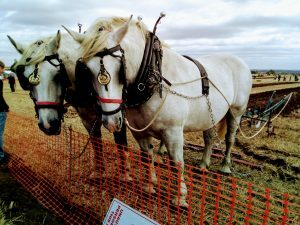 ~ all those days telling hundreds of visitors about the project was a good rehearsal, and it all just rolled off the tongue! 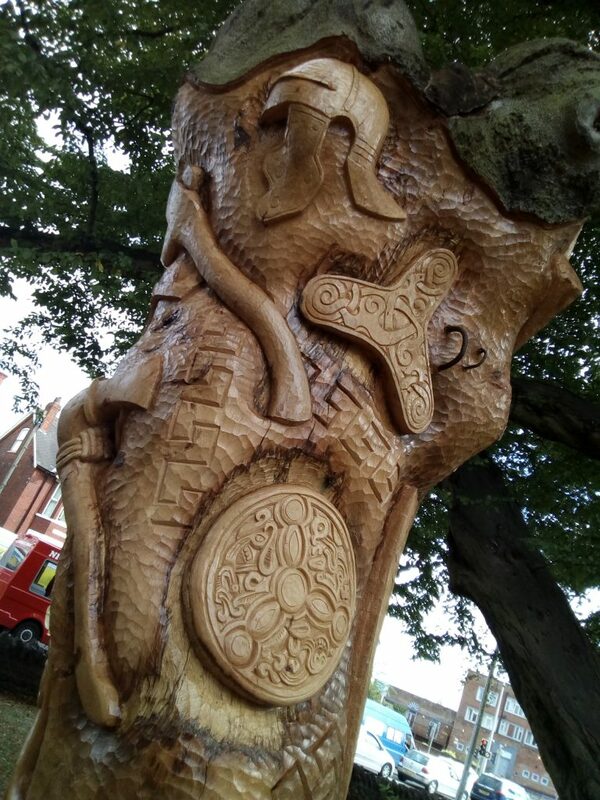 The last item on the tree was one of the trickiest ~ the Bushfield Road Infant School pupils had had their imaginations caught by the fossils, Romans and Vikings quite easily, but maybe understandably they weren’t as taken with the steel-industry displays from the museum; I think perhaps when the youngsters have grown up surrounded by such industry it’s been just another element of everyday life, and it’s possibly only as they get older that the magic and importance of the steelworks to the area will hit home. 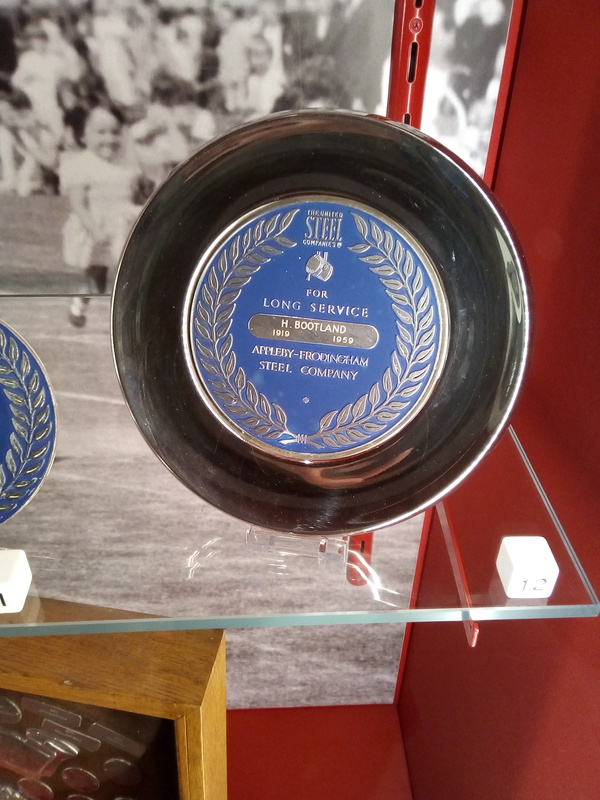 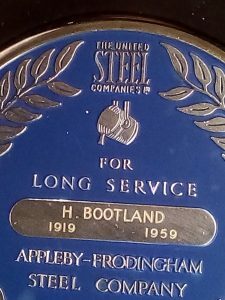 A bit of artistic license with the flow of the steel with the ladle, just so it didn’t stop dead as on the plaque.